With price, analysis and live photographs. 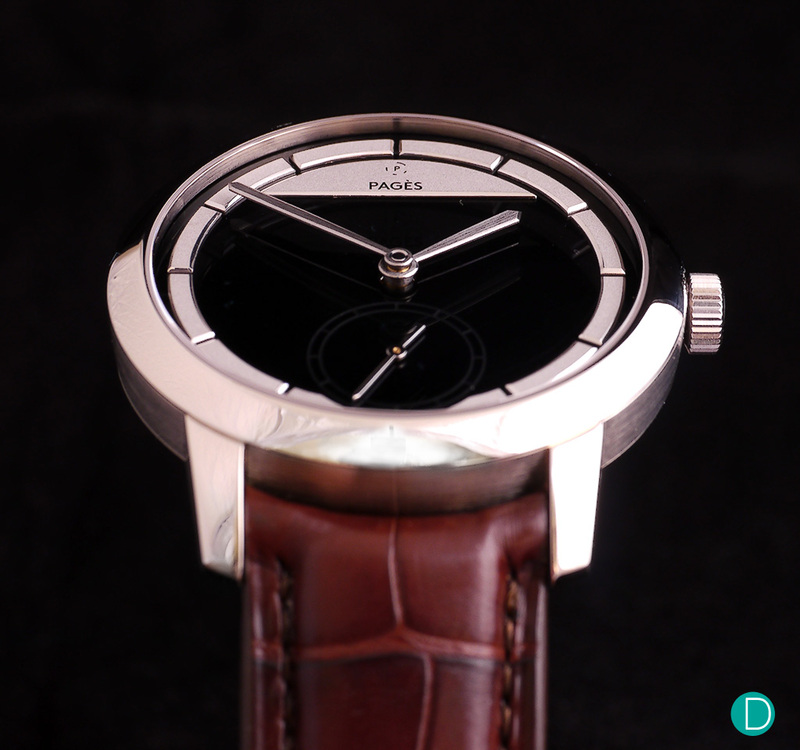 Over the course of last week, I had the privilege of meeting Raul Pages, founder and Master Watchmaker of Pagès Watches to better understand his latest creation, the Soberly Onyx. We first covered the Soberly Onyx back in May where our editorial director, Mr. Peter Chong shared about Raul’s impressive watchmaking background. Having worked in the same workshop as Raul in Parmigiani Fleurier, Peter was able to witness Raul taking on the challenge of restoring iconic pieces such as the Breguet Symphatique clock and the famous Frères Rochat Singing Bird Pistols. It is a dream for almost all watchmakers to create their own watch, one that represents them and the values they endear in traditional watchmaking. Raul shared that his experience with restorative works has given him the opportunity to master different skillsets such as the creation of parts from scratch that has aided him in the creation of the Soberly Onyx. This timepiece is uniquely different with its use of an Onyx, a rare gemstone for the dial as well as the use of a Cyma caliber to make up the movement. What is so impressive about the process of making the Soberly Onyx is the fact that Raul is the only one involved in every step of making the watch. From conceptualization & design to the finishing of the Soberly Onyx, he covers every aspect of the watch and does an excellent job in doing so. By being involved in every step of the process, it causes the process to take up a lot of time and not be efficient which may seem to be a disadvantage. However, it presents other advantages such as the ability to allow his clients to be involved with every part of the process; customization of certain parts or special requests. The Soberly Onyx is a very unique timepiece with a dial made using a rare gemstone with an exceptional finish on it. The Soberly Onyx comes in an 18K White Gold case that is 40 mm in diameter. We love how the watch sits so nicely on the wrist and the size of it is just nice for a dress watch. As mentioned earlier, the dial is made using onyx and the crown, also handmade in white gold features an onyx cabochon inset. Raul shared that sourcing for the best onyx materials is not the biggest challenge but rather, the need to cut a naturally-hard material like onyx poses a challenge especially when you have to keep it aesthetically pleasing in terms of shape. 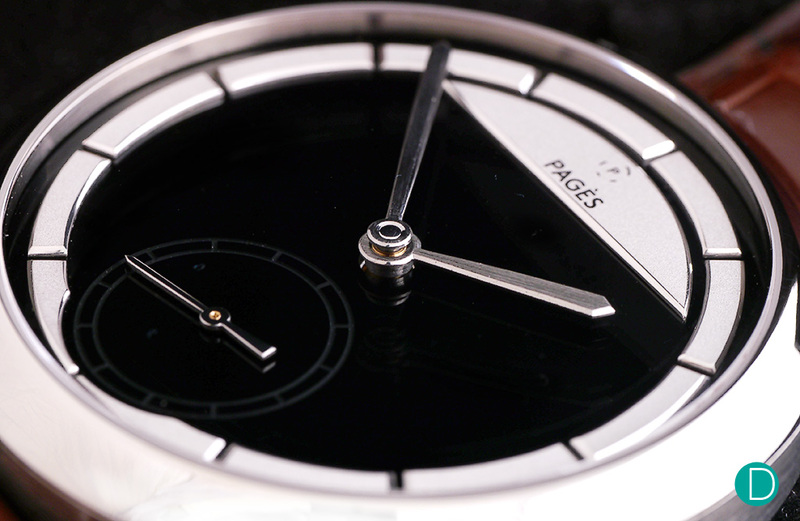 The dial is made using onyx and the crown, also handmade in white gold features an onyx cabochon inset. The dial features handmade 18k white gold frosted indexes with straight-grained flanks and polished beveling. The indexes are well-designed and frosted which allows it to complement very well with the mirror polished black onyx surface and the polished bezel. The curvatures of the indexes also sit symmetrically well with the round profile of the watch, giving it an aesthetically pleasing look. The look is further complemented by the handmade straight-grained hardened steel hands with polished beveling which sweeps so beautifully across the onyx dial surface. The hands are also set higher to ensure that the reflection of the hands does not look like double vision but distinct given that the dial is mirror polished, which looks better in our opinion. The hands are set higher to ensure that the reflection does not look like double vision on a mirror-polished dial. If one takes a closer look at the Soberly Onyx’s dial, one would notice a small second display at the 6 o’clock position. The small second display was achieved by engraving the dial and in different positions under light, the small seconds display may seem to be either floating or disappearing thus its description, the mysterious small second display. The small second hand is black polished and beveled to allow it to remain subtle on the dial as it is stealthily positioned at the 6 o’clock position. The mysterious small second display can be seen at the 6 o’clock position. 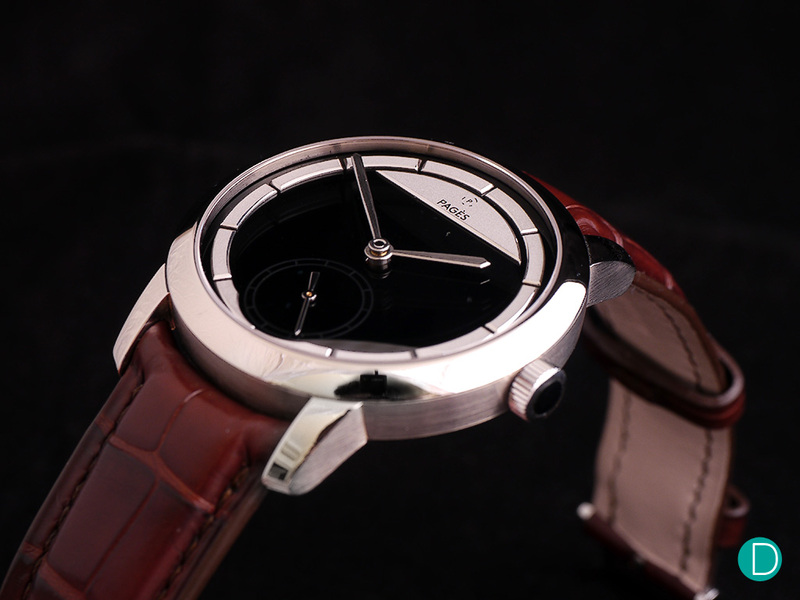 The Soberly Onyx’s movement base is a 1950’s Cyma 586k caliber and features a power reserve of up to 42 hours. Raul has put in a lot of effort to completely rework and finish the movement and some of the components in the movement were made from scratch. Raul has pointed out that his experience in restorative works has helped him significantly in this aspect, creating parts from scratch. 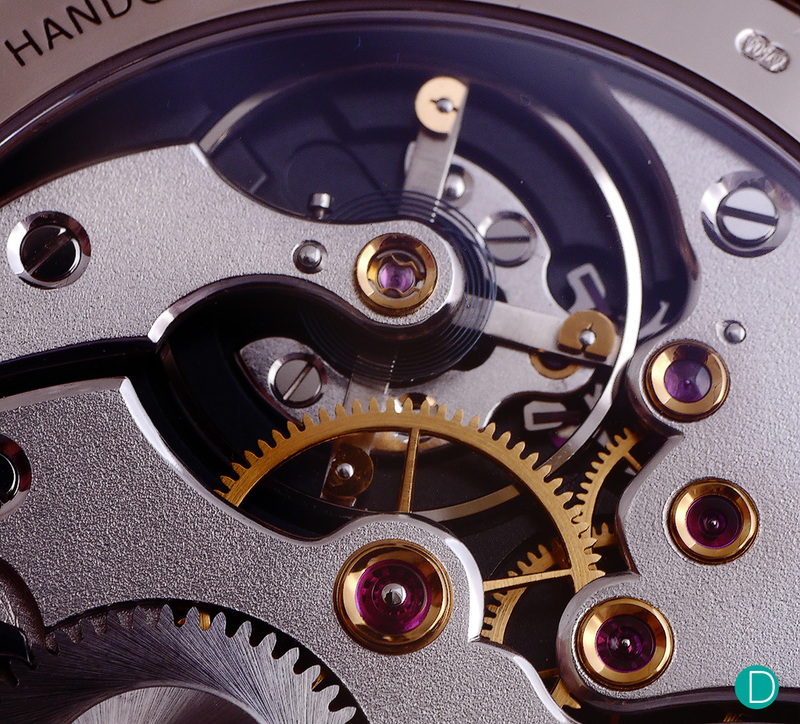 When we took a closer look at the movement, the finishing is impeccable and of the highest standards. The frosting seen on the rhodium plated maillechort plates and bridges are done by hand and it gives the movement a very unique look not like the usual Côtes de Genève patterns we see often in movements. 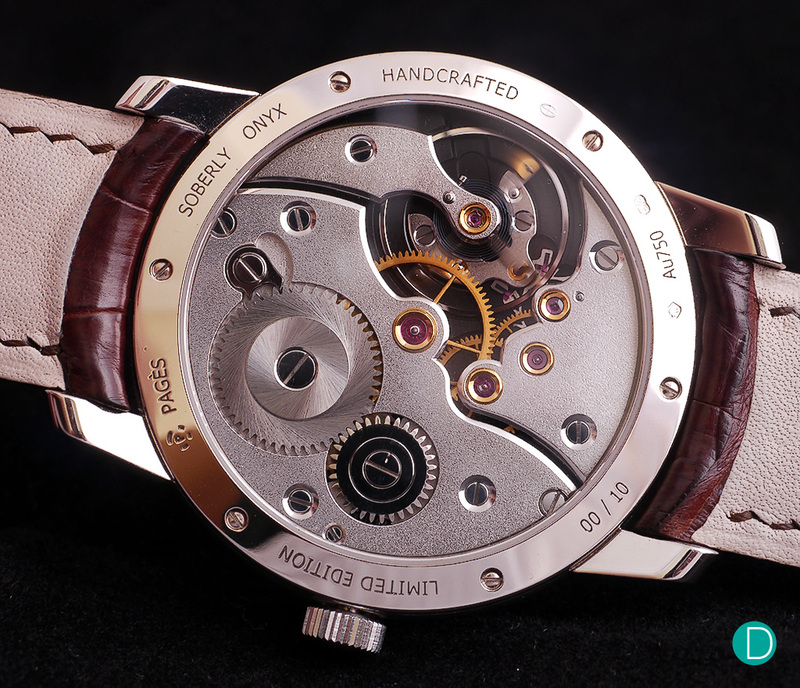 The see-through case back allows for a full view of the movement and its excellent finishing, a plus point definitely. 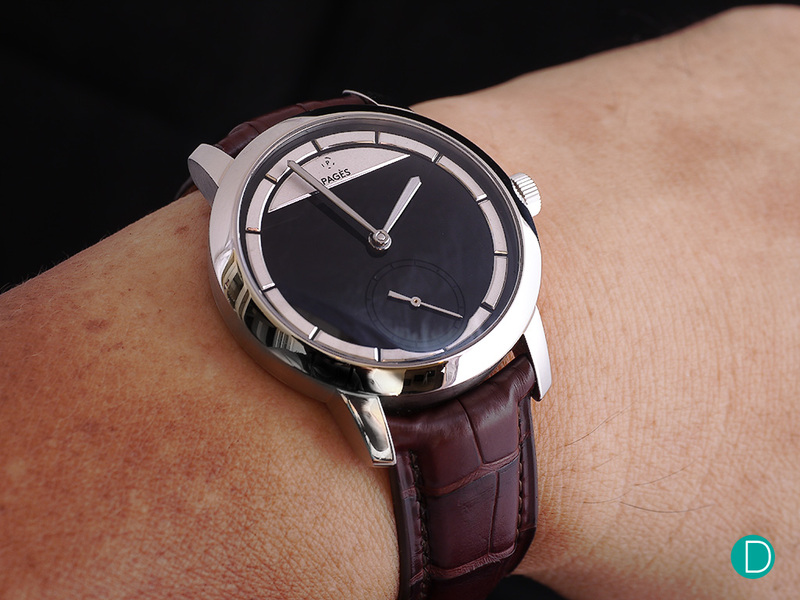 The movement base in the Soberly Onyx is a 1950’s Cyma that was totally reworked and finished by Raul Pages. The balance wheel in the movement is pretty big and measures 13.4 mm, bearing four arms. The fact that the movement operates at a slow rate of 18,000 bph allows the balance wheel to be huge and the four arms does it part to increase the stability of the movement. One of the big challenges Raul shared was having to do a Breguet overcoil and making sure it fits well in the extremely small allowance of space between the wheels. As mentioned in our first look at the Soberly Onyx, the balance is built using the principles of construction laid out by George Daniels in his book, Watchmaking. The balance wheel in the movement is bears four arms to ensure greater stability. The Soberly Onyx is an excellent start for Pagès Watches, utilizing rare materials and high quality craftsmanship to differentiate itself from common brands we are familiar with. Raul has worked very hard to turn his dreams into reality and has done so remarkably well, giving the Soberly Onyx its own soul and identity with its uniqueness in design and quality finishing. The watch is priced at CHF 48,000 before taxes and only has a limited release of 10 pieces. 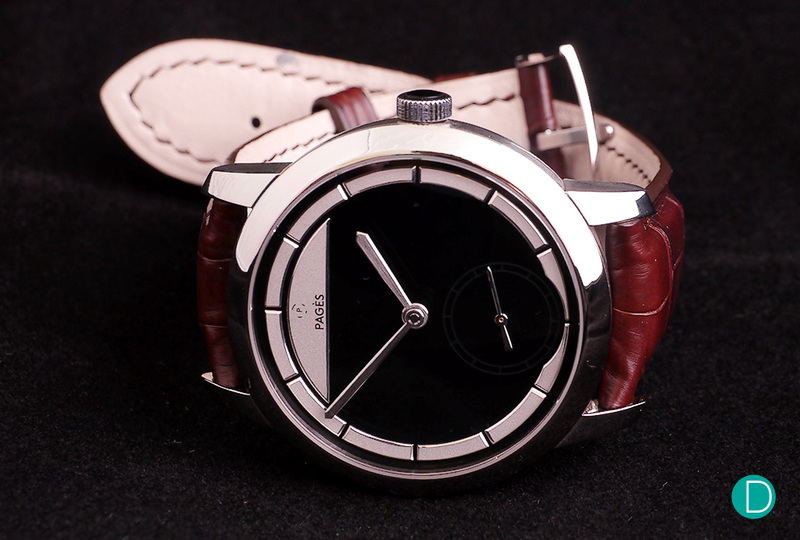 When you consider the fact that the entire watch from start to finish was made solely by Raul Pages and the quality of the materials used, we have to say the watch is reasonably priced. For lovers of independent watch brands, the Soberly Onyx is just the start of many big things to come from Pagès Watches and we are sure of that given the impressive work on the Soberly Onyx.